I noticed the fuss made by other foodie bloggers over pomegranates the last few months, but I didn’t really think about it. I noticed the bins of pomegranates that eventually showed up for a month at even my rural town’s grocery stores, but I didn’t think much of them. To be honest, my knowledge of pomegranates pretty much began and ended with the myth of Persephone and Hades. I didn’t really “get” the concept of how Persephone could eat six seeds, resulting in her staying six months, one for each seeds, with Hades each year. To me, seeds in fruit were seeds in fruits like apples, oranges, pears and watermelons: the stuff you spit out, cut out or otherwise avoid. As far as I was concerned, you’d have to be pretty desperate to eat an apple seed, much less six of them. In fact, the seeds of the pomegranate, which are more properly called “arils”, are the only edible part of the pomegranate. The outer shell consists of the thick, bitter pith, with membranes covering the arils that look like honeycomb when they’re pulled away. The glossy red arils, however, burst in your mouth with pops of highly concentrated flavors intermingling sour and sweet. I found this out when my mom decided to try a pomegranate at Christmas, preparing a quick salad of spinach greens, avocados and pomegranate. At first, I wasn’t sure if the whole aril was edible, being as there is a tiny hard seed inside each one (which is why it is called an aril), but they are – it is only the husk of the fruit that is discarded. (If you try to taste a bit, you’ll quickly understand why.) Once I got used to it, I found I really liked pomegranate! They’re fun to crunch and add a lot to a simple salad. So, my husband and I decided we wanted to have pomegranate again and bought one just before they went out of season. (Pomegranates have a short window of availability from October to January, and it’s even shorter in my small town.) We weren’t disappointed. They’re easy to open and here’s my method. I scored the skin of the pomegranate with a sharp knife and pulled away the husk in sections, following the natural sections inside. Then, I simply pulled the inner membranes off the arils and ran my thumb along the side to “pop” them off into a bowl. It worked very well for me, but I know another recommended method is to cut the pomegranate in half and rinse the arils out under running water into a sieve. 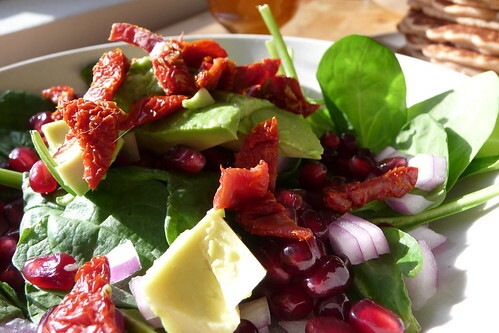 We had a couple of pomegranate salads and I’m sorry to see them disappear from stores. They were awfully good. Next October, when everyone goes gaga over pomegranates being back in season, I won’t pass them by. This recipe doesn’t specify units because I feel they’re arbitrary, with the exception of a couple of suggested portions. Use as much as you want and whatever your favorite salad ingredients are. Since this recipe was used at lunch, I didn’t put too much in. Combine everything in a salad bowl and toss well. This entry was posted in american, dairy-free, gluten-free, recipes, salad, untranslated, vegetable, vegetarian. Bookmark the permalink.